Here`s a short webcast (in Norwegian) on how to build a Hyper-V Cluster with SCVMM. One superb feature in SCVMM is that you are now able to patch the resources in the Fabric, which also includes your Hyper-V Clusters. 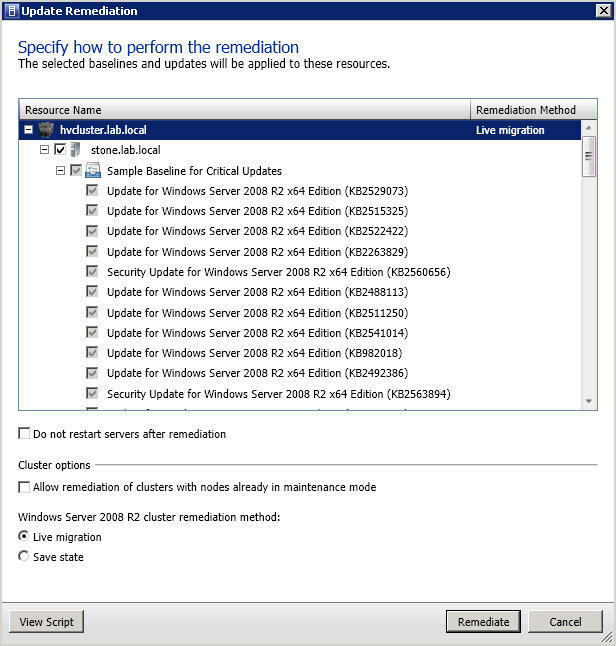 How are you usually patching your Hyper-V Cluster? You have to initiate the Maintenance mode, patch the node, stop Maintenance mode, and so the story continues with the next node. 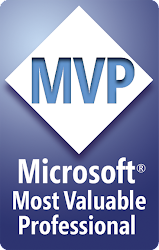 SCVMM 2012 will do this automatically for you, so that you can spend your valuable time with more important tasks, like focusing on pro-active management and best practices. 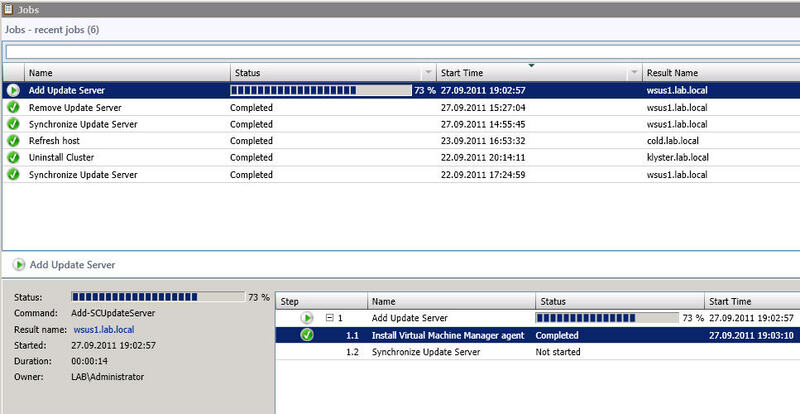 First, you`ll need a WSUS-server in your domain to serve the Fabric with the defined updates. 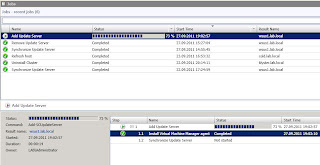 In this walkthrough we`re going to use a dedicated WSUS server. 6. 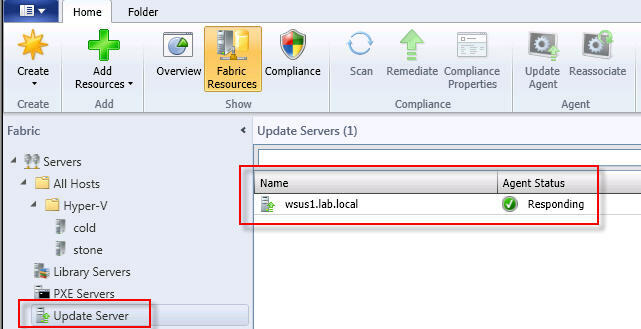 Navigate to the Fabric in SCVMM, select Update Servers, right click, and add your WSUS server. Specify the FQDN name, and the TCP port the server is listening on. If you have ran the default installation of WSUS and are using the default Web-configuration, the TCP port should be 80. 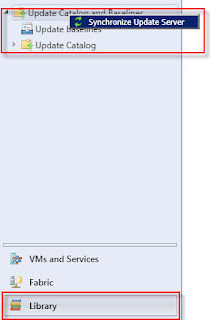 Use a Run as Account or specify the required credentials to add your server to SCVMM. 7. Once the server is added, you`ll be able to manage it directly from SCVMM. (Right click the server in Fabric, and select properties. Here you can change updates classifications, products etc). 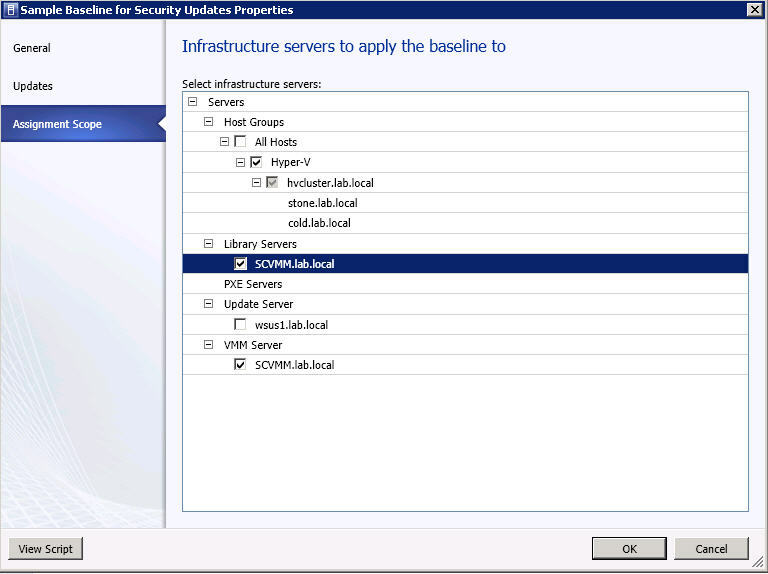 Now, you should have your WSUS server available in SCVMM. The next steps will show you how to create Update Baselines for your resources. 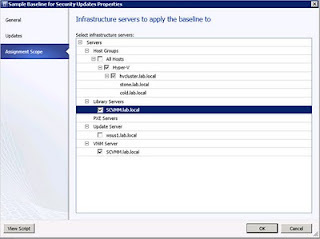 An update baseline contains a set of required updates that is then scoped to an assignment such as a host group, a stand-alone host, a host cluster, or a SCVMM management server. A compliance scan that are assigned to a baseline are graded for compliance with their assigned baselines. 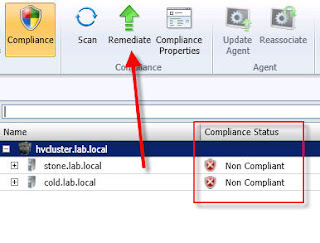 When a computer is found noncompliant, an administrator will bring the computer into compliance through update remediation. You can configure update baselines to host groups and to individual computers based on their role in SCVMM. 4. Here you can add/remove update baselines from the baselines that are listed. 5. Click Assignment Scope to open the Assignment Scope and select host groups, host clusters, and computers to add to the baseline. All computers are represented by the roles they have in SCVMM. To apply a baseline to all hosts, you have to select the All Hosts root host group. 6. Click OK to save the changes you`ve made. You can also create a new update baseline in SCVMM. Repeat step 1 and in the Home page in the Create group, click Baseline so the Update Baseline Wizard starts. This wizard will take you through the required steps to build a baseline and let you select the updates you want. Create the baseline and select the correct Assignment Scope for the updates (Hyper-V updates for Hyper-V hosts, and so on). If you`ve done this right, you should be able to see the update baseline in the Library pane, expand Updates and Baselines Catalog, and then click Baselines. Now, let`s navigate back to the Fabric, and check if our resources are compliant. 1. Select a Host group, click the Home tab, and select a host. 2. Click Compliance and initiate a Scan with the scan button. 3. 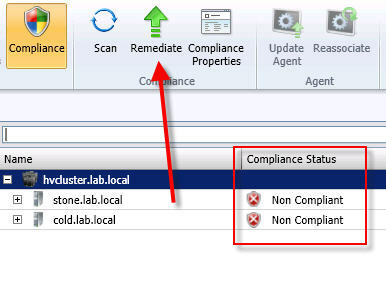 If some of the hosts are not compliance, select Remediate. 6. 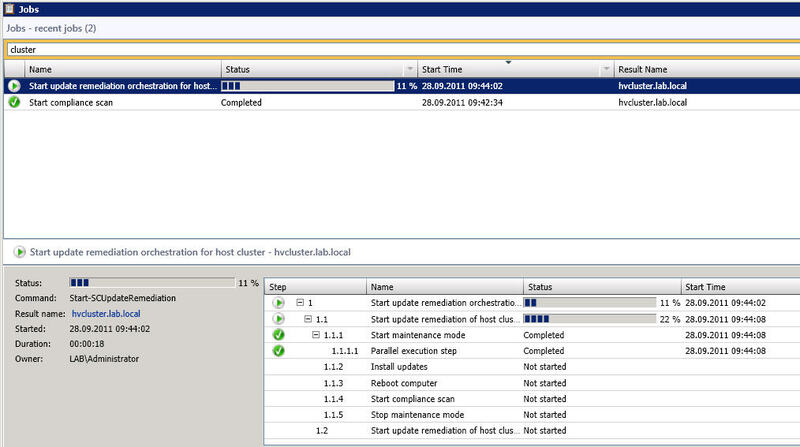 Repeat all the 5 steps on each and every node in the cluster. Windows Server 8 Developer Preview, and why you should care. This article is based on the big Private Cloud picture, and what changes this will bring. I will be focusing on the virtualization layer at this point, and what you need to prepare for to take advantage of the technology. 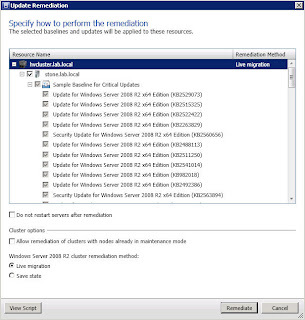 First of all, there are some new nice features that let you administer and manage your Windows Server more easily. Not only one single server at the time, but many. A so called multiserver management lets you manage both virtual and physical server from the same single pane of glass. The deployment of server roles and features are also made much more simple, with scenario based deployment. This will also include both physical, virtual, local, and remote. 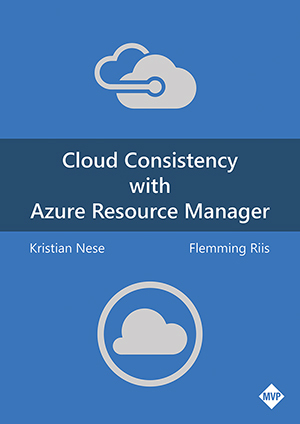 Use your existing skills to make quicker and more reliable setups in your environment with this new upgrade. But let`s move over to the important features, related to virtualization and Hyper-V.
First of all, you can now explode your current cluster restrictions, and have as many as 63 nodes and 4,000 VMs per cluster. Along with improved performance (they say), cluster-aware patching (we have this already in SCVMM 2012, with an orchestrated routine that updates every node in the cluster in an automated and optimized way) we also get data deduplication and live storage migration. Speaking of live migration, we are now able to live migrate VMs – not only one at a time, but many, and we can also schedule this. And if you have more important VMs than the other (I bet you have), you can now define priorities on the VM level. One of the most common question I`ve seen in the Hyper-V forum, is questions related to Virtual Networks. What is a virtual network in Hyper-V, and how does it works? Especially myself and Brian Ehlert uses the word “switch” when we`re explaining this. 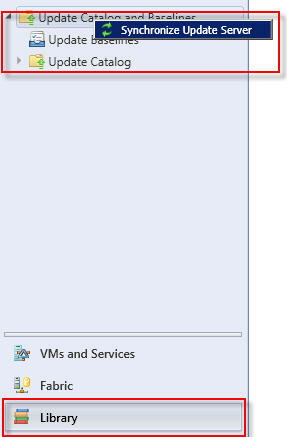 And this has finally changed now in the next version of Windows Server. We call it Virtual Switch now, because that`s what it is. And add native NIC teaming to it, and you can see that we`re moving further toward the cloud. Hyper-V Replica will also be a business saver for the small and medium businesses, allowing you to implement a cheap disaster recovery plan. It only requires disk and networking. Now, this was just some of the new features. I will suggest that you should take a closer look at Aidan Finn`s blog at http://aidanfinn.com to get more details. He played around at the Build-conference, and is a subject matter expert in Hyper-V.
Let`s focus on the virtualization layer a bit more. Ok – so we have some serious changes in Hyper-V. What should be our focus? High availability and continuously available systems. There will be some new “best practices” I guess, but some of the best practices we already know from Hyper-V 2008 R2 will still apply. It will still be files on a disk, and these files will require the disk storage subsystem to handle the IOPS. No easy way out to place your VMs on an old file server, and expect fantastic performance. However, all these major upgrades will be transmitted to the System Center-portfolio. 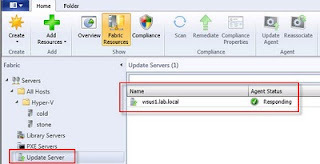 System Center Virtual Machine Manager 2012 will have to understand the virtualization layer in detail, and Fabric Management must be aware of how you have defined your clusters, what kind of storage solution you are using, and the new enhanced networking features. I guess we`re talking SCVMM 2012 SP1 when we will be playing with this in production. DPM 2012 must also know this layer, to understand what and where to initiate the backup. System Center Orchestrator 2012 will most likely give us some interesting and fun integration packs to support complex tasks to be automated, and System Center Operation Manager 2012 will monitor every new feature in detail. I`m really looking forward to 2012. Stay sharp, and download the Windows Server 8 Developer preview today! Together with Olav Tvedt (@olavtwitt), we`re kick starting MTUG located in Bergen with some interesting sessions this autumn. On Tuesday, I`ll cover the private cloud, and will give an insight to the delivery model, and how you can achieve cloud-technology on premise. I will be touching several products, but the main focus will be on SCVMM 2012 (of course) and Hyper-V. But there is a lot more than just those two products to define the cloud. It`s important to know that cloud is a lot more than just server virtualization, and that the IT-pro has to focus on some “new” layers as well, as orchestration, automation, and servicing. Only two seats left at the moment. Aidan Finn - a rock star! Aidan is an IT-pro based in Ireland, and is – in my opinion not just an MVP, but a Rock star! He has just spent some exciting days at the Build-conference, and blogged more than a journalist have written articles these days. I think I can speak on behalf of the rest of the community, and really thank Aidan for everything he share on a day to day basis, especially from the build conference which contained a lot of new and useful information on private/public cloud, and Hyper-V in Windows Server 8. What event will Windows 8 RTM be announced at? 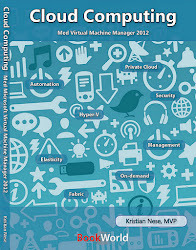 Aidan has also written several books, and the one I will mention here is related to Hyper-V. I remember back in August 2010 when I decided to take the MCITP Virtualization Administrator 2008 R2 exams. There were no available books from Microsoft Press, and I had to rely on my own knowledge and skill to take all these three exams. I used my lab and the resources available on the big humpy internet. However, if I was aware of this book before the exam, I would definitely use this as my guidance. This book is so well written, and covers every part of a virtualization project in general, and Hyper-V in detail. Not just Hyper-V, but also the required components to manage this entirely, likes SCOM, SCVMM, SCCM, and DPM. Aidan combines humor and an in depth technical knowledge in his writing, and it`s quite fun to read it over and over again to refresh some almost forgotten skills. Either you are a Hyper-V expert, or brand new in the virtualization game – buy this book, and read it! It`s not a useless sentence in the entire book, and it will help you to get the best understanding about Hyper-V technology from the greatest rock star in the Hyper-V community. Where to buy it? Grab it from Amazon! Here`s a collection of useful links to products and guides that defines the basis of Microsoft`s cloud offerings. SCVMM 2012 RC - GO AND GET IT! Want to be the IT-pro of the future? Realize it`s more than just server virtualization in a private cloud. it`s also about management, automation, applications, security, orchestration, and service. The management part may be the core part in your work days on a daily basis, so start with SCVMM 2012. Hopefully, for those who attended my sessions at TechDays this week, you`ll use some of the information during your steps towards your private cloud implementations. I`ll have to update my blog series on SCVMM 2012 with correct information and screenshots, since some of the features are now changed/upgraded in the RC version.